One of the outcomes of the recent American Chemical Society meeting in New Orleans is that my usual haunt – the Division of Chemical Information (CINF) – needs to do a bit more work to publicise itself, and boost the membership count, so it can continue to be an important and relevant fixture in the cheminformatics space. To this end a brainstorming session was held the night before the talks began, and each of us scribbled out as many ideas as we could think of on Post-It notes. One of the ideas that Tony Williams (aka ChemConnector) came up with is to encourage members to tweet out their division-related activities, and use the hashtag #ACSCINF. 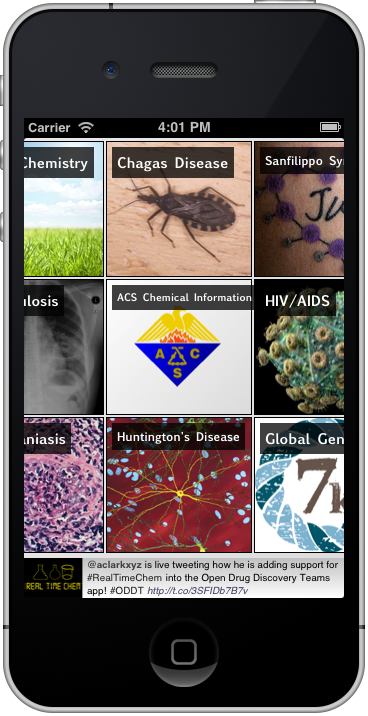 Then, in the tradition of #RealTimeChem, add a new topic to the Open Drug Discovery Teams app. The app is free. Its purpose is to serve as an aggregator of open content documents for specific science-related topics, which mainly consist of rare & neglected diseases, but also include some precompetitive topics like green chemistry, and some more experimental efforts to involve cheminformaticians in social networking, namely #RealTimeChem and ACS CINF. The ODDT app contacts a server for its content, which in turn routinely scrapes Twitter and specific RSS feeds. The Twitter-obtained content is an effort to make use of the fact that despite that network being a torrential flood of inanity, there are quite a few sources who post valuable and interesting links, and make the effort to classify their contributions with specific hashtags. ODDT is configured to look for these, and compile them into relevant topics, which means that if you find a relevant document (typically a web page), you can “tweet it into ODDT” by emitting the link and the appropriate hashtag, e.g. #Malaria for articles relating to malaria research. The app provides this information via a browsing interface that was inspired by the very popular Flipboard app. The second important aspect of its functionality is crowd curation. Documents that are scraped from social networks and added to the system start with an endorsement ranking of 0, which means that they will be kept in the “inbox” for a week, but after that they get flushed. Unless, that is, a user of the ODDT app endorses it. Documents can be voted down as well as up, so as long as its rating stays greater than zero, it will be retained indefinitely. In this way, anything that wasn’t important enough for somebody to endorse gets digested and excreted, leaving behind only the content that people consider valuable. Try it out. And let us know what you think!